gitSQL is a *free front end GUI for scripting out SQL objects into Flat File for use with Source Control such as GIT. Under the hood; gitSQL discovers database objects and then scripts them out using native database code. 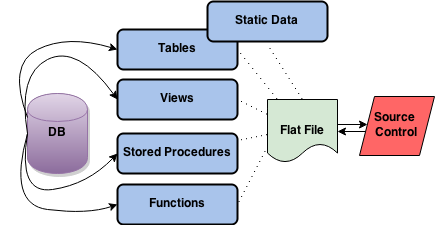 The schema is scripted out as create statements so that a database can be built directly from source control. Does it script out Data too? Yes - it does. Data can be scripted out into static data files. These files can then be imported into a database. *free version limited to 20 tables, 10 views, 10 stored procedures and 10 functions.